My 61, with mildly modified engine goes through about a coil per year. The symptoms are usually loss of power and occasional misfires. I have the Pertronix Ignitor 1 in the distributor and oil-filled Flamethrower coil, both wired with 12 volts. I’ve tried the MSD Blaster 2 coil as well, with a resistor. Both coil types have been found to be out of spec (primary and/or secondary resistance) after failure. Of note, even new coils have been found out of spec. Maybe a quality issue. My car does not have A/C and the coil bracket is attached to the front of the driver side engine head. The engine vibrates a little. My current plan is to try another Flamethrower coil, epoxy filled against vibration, and install a 3”X5” heat shield made of several layers of heat barrier material between the bracket and head with a nylon washer under the bracket bolt head. If this doesn’t improve my luck with coils, I’ll move it to a different location, off the engine. Wires are new, Taylor 10mm spiral wires. Engine grounds are multiple and good. Comments and ideas will be appreciated. I had them fail until I found out that a standard coil needs to be mounted upright and preferably off the eng. So I moved up to a MSD "High Vibration" coil, which is still mounted on the eng. It's epoxy filled so nothing can move around in it and fail. So far, so good. From your comments it sounds like I might be on the right track by going to an epoxy-filled coil. I’ll still install a heat shield. It can’t hurt. P.S. - If the rest of your car is anything like the picture you posted of your engine bay, it’s a stunner! Thanks Bill, I appreciate the compliment! My recent misfire issue resolved itself after I replaced a cracked fairly new spark plug boot and decarbed the engine with Seafoam. The decarb was done when a cylinder was found to be 10% less in compression than the rest and also failed a leakdown test. I could hear air at the oil fill tube during the test which means rings broken or gummed up with carbon. I’m hoping for the latter. My engine had little use and no highway use for 6 months of this year which may have been the cause. Repeated decarbs with Seafoam, which I have used successfully on 2-stroke outboards, and a few 50+ mile trips I hope will be the cure. It runs pretty well. I’m not sure if the cracked boot or glowing carbon caused the misfire. I still plan to tweak the ignition by upgrading to Ignitor 2 module and epoxy coil. 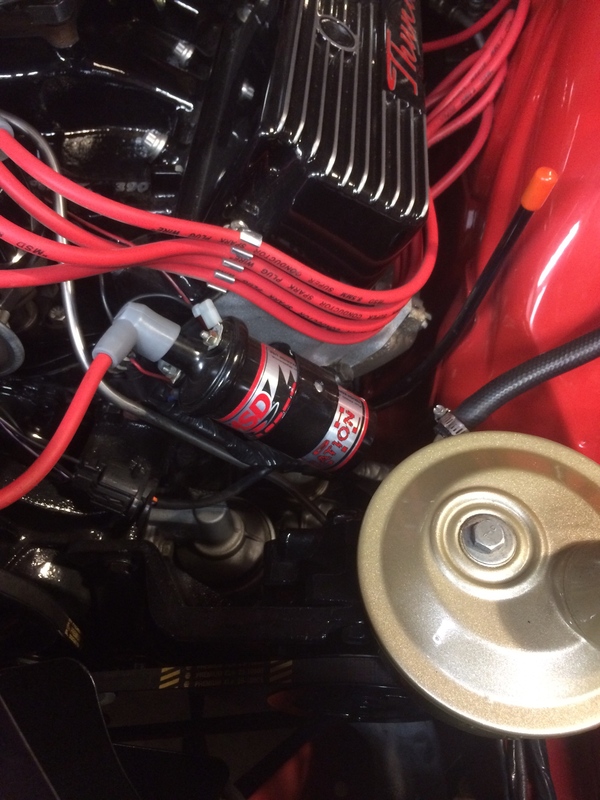 Seafoam through the carburetor while engine running plus cold soaks with Seafoam via the spark plug hole over several days followed by an oil change and an 80 mile run with Seafoam in the fuel has resulted in 35% leakdown vs 70% before treatment. Will keep Seafoam in the fuel and do another decarb through the carburetor soon. On the road to recovery I think. Issue was not a broken ring...just gummed up. Misfire obviously not caused by the coil. Was either the cracked spark plug boot or glowing carbon igniting fuel vapors. 6 months of infrequent, low rpm running was not good for my engine. It runs well now with little shake at idle. I removed the rockers, then the valve springs and stem seals on the weak cylinder. I used rope in the cylinder (compressed by the piston) to hold the valves in place. Using a medicine dropper I dripped de-carb cleaner on the valve stem, letting it make its way between the valve stem and valve guide, hopefully, to the backside of the valve. I spun the valve stem by hand a few times. I repeated this process many times per day over several days. I measured the valve spring height at intake valve closed and tested the spring at this height, finding it to be 85-90 lbs. I repeated this for the exhaust valve and spring with similar results. Research indicated that 110-130 lbs at valve closed is recommended for big blocks and is compatible with my camshaft. I also noted that the spring coils were not well aligned. I am now convinced that my engine cough was at least partly caused by weak valve springs. For test purposes, to increase spring pressure a few lbs, i installed a 0.030” shim under the spring of the intake valve. In case my engine was passing too much oily crankcase vapors to the affected cylinder via my quasi-1961 styled PCV system, I installed an air/oil separator can in the PCV line. After a 200 mile trip I performed another leakdown test on the weak cylinder. The results with 80 psi air pressure was 19% loss, marginal I have read but a HUGE improvement and acceptable for a 2000 mile/yr car. Whew! I feared a valve job might be required, a tough removal job on an engine with headers. Much relieved. I have also noticed that engine cough at cold startup is much reduced. On to replacing all valve springs. Due to slight variation in spring height at valve closed, some may require shims to get uniform spring loads. Comp Cams 972’s were selected (124 lbs at 1.8” valve closed height). Wow Bill, I'm impressed by your great work and results. RedBird et al, thanks for your interest. I bought 2 sets of Comp 972 valve springs, planning to test them and use the best 16 springs. (Thanks GeorgeG for the suggestion). At 1.8” installed height, spring pressure is 124 lbs +/- 10% per Comp specs. Unfortunately, 19 of 32 springs tested outside the spec. None were at or above 124 lbs. I returned all the springs. The +/- 10% spec seems to be common in the industry but I hope my installation will be better. Alex’s Parts is shipping a set to me with a spec of 120 lbs at 1.795”. Alex’s batch tests before shipment and promised +/- a couple of lbs. Wonderful! I will test and confirm upon receipt. Installation may take a while with springtime chores taking priority. Meanwhile, my car runs and drives just fine. Alex’s batch tests before shipment and promised +/- a couple of lbs. Wonderful! I will test and confirm upon receipt. I'd be interested in hearing the results Bill, as I installed springs and keepers from Alex in my car.